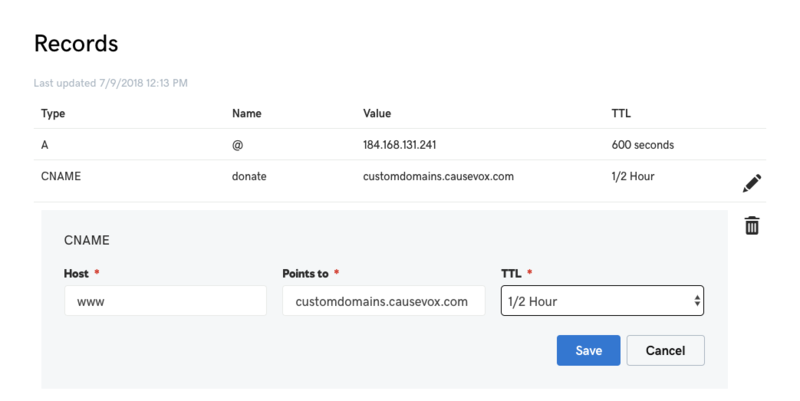 Custom domains allow you to have your CauseVox fundraising site sit on any root domain or subdomain that you own. By default, your campaign sits on the CauseVox root domain (ex. http://campaignname.causevox.com). Custom domains let you host your campaign on a subdomain of your organization's corporate website like " http://my.orgwebsite.org". How to setup custom domains? This can be tricky to set up, and is only recommended for advanced users. To set it up yourself, you'll need to have administrative access to your domain name at your registrar. Common registrars are Godaddy and Register. Then you'll need to follow the registrar's instructions to point the domain's CNAME record to customdomains.causevox.com. Please note that you need to change your domain's or sub-domain's CNAME record, not its nameservers. And, you don't need to forward or redirect anything, you only need to change the CNAME record. Once you've done this, you may need to wait up to 72 hours for the change to take effect. If the domain is set up properly, you should see your CauseVox fundraising site when you visit your domain. We won't be able to provide support for custom domains until after 72 hours. If you're previously set up a custom domain pointing to our IP address, you'll need to update it so it's secured. Here's how to update it. Note: Your custom domain will only work when your CauseVox campaign is enabled. Otherwise, an error message from CauseVox will be displayed. Note: You cannot use a "naked" domain to point to CauseVox (ie yourwebsite.org), so you’ll want to set up a subdomain with 'www.' in front of it. Let's say your custom domain name is "www.example.org". Here are the steps you'd take to set that up that A-record. Step 1: Log in to your Godaddy account. 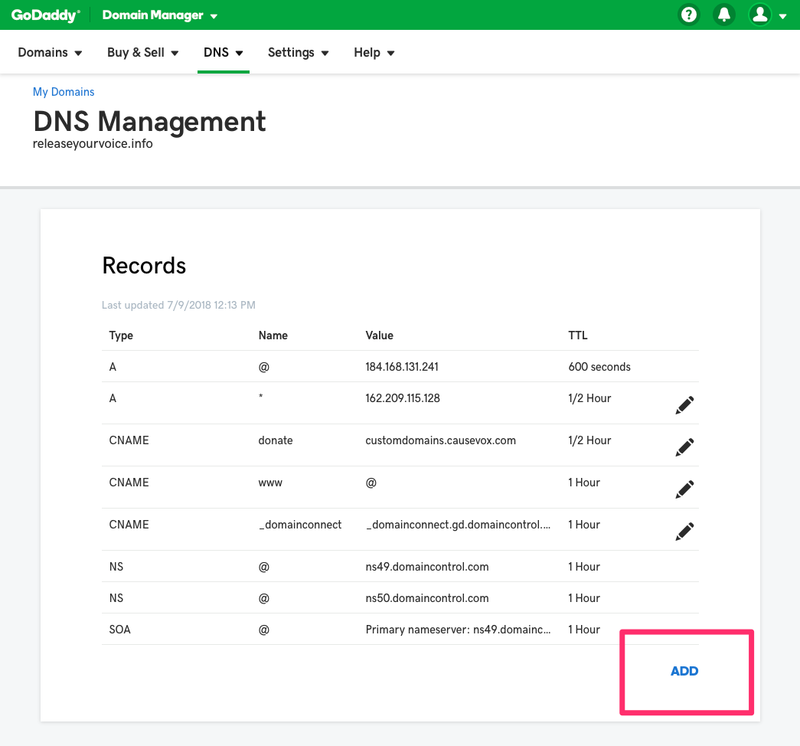 Step 2: Navigate to the domain and then select "Manage Connection." Step 3: Under Records, and edit the CNAME with 'Host' label 'www' and change the points to value from @ to customdomains.causevox.com. You'll also want to lower the TTL value to 1/2 hour to help your custom domain load quicker. Step 5: Go to your CauseVox admin and enter in the custom domain in the site settings. Let's say your organization website is "www.example.org" and you want to setup a custom sub-domain for your CauseVox site on "http://my.example.org". Here are the steps you'd take to set that up that A-record. Step 3: Under Records, select 'Add' in the bottom right corner. Step 4: Under Type, select CNAME and under 'Host' add your subdomain. For our example, this is where you'd enter 'my.' Next, you'll want to enter in customdomains.causevox.com as the 'points to' value. You'll also want to lower the TTL value to 1/2 hour to help your custom domain load quicker. Once you've done this, you may need to wait up to 72 hours for the change to take effect. If the domain is set up properly, you should see your CauseVox fundraising site when you visit your domain. People who visit your CauseVox subdomain and custom domain will see your campaign. For example, " http://example.causevox.com" and “http://my.example.org" will lead you to your campaign page.